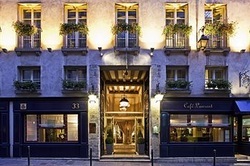 Admittedly, parts of this 4 star Paris hotel are within a 20th century building, but the main focus of the establishment is firmly within what was once a 17th century stately townhouse. There are plenty of old features and antiques to be found at d’Aubusson: Versailles parquet floors, a fireplace made from Burgundian stone, and the Aubusson tapestries from which it derives its name. Heritage-travellers will no doubt prefer the more traditional Grand Luxe rooms on the top floors (many have original beams on display), but anyone who stays here can soak up the atmosphere of the Louis XV style lounge. Moreover, the hotel’s famous Café Laurent bar is right alongside: originally opened in 1690, the establishment has long been a renowned meeting place for high-profile artistic and literary Parisians. However, it isn’t just Hotel d’Aubusson’s atmosphere and style that makes it one of the finest Parisian hotels. Indeed, it’s enviable position on the Left Bank means that Notre Dame Cathedral, the Louvre and the Musée d'Orsay are all close by. For a romantic location at the heart of Saint-Germain-des-Pres, one would be hard pushed to equal the place.